I am extremely exhausted tonight, preparing for my forthcoming trip to the former Soviet Union (Kiev, Rostov, Moscow, Minsk, Vilnius, Kaunas on trip to research our families in Rostov and Lithuania, but felt the need to put at least something up here on the occasion of what would have been Stan's 83rd birthday. We all miss him terribly and it would have been wonderful to share with him the joy of our geneological hunt into both sides of his family, which has succeeded beyond all expectation in terms of where we were at soon after his death when we started this project. My biggest excitement recently was finding in a book at Yeshiva University in NY that Rabbi Isaac Elchanan Spektor was the grandfather of Joseph Rabinovitch and ttherefore our great-great-great grandfather. Stan always told me we were descended from Rabbi Spektor, but only recently, when reading the biography of Rabbi Spektor by Rabbi Efraim Shimoff, based on Toldos Yitzhak, by Yitzhak LIfshitz, Rabbi Spektor's secretary, did I find the exact connection. According to the book, my great-grandfather Yosef Rabinowitz (or Rabinovich) was the grandson of Rabbi Spektor and the son of Chaim, the rabbi's oldest son. According to Lifshitz, when Chaim died at the age of 40 in 1874, Rabbi Spektor took charge of his grandson, then 19 and taught him Talmud and Jewish Codes and found him a bride. (According to U.S. census records, her name was Lena Lincoff and the newlywed couple emigrated together to New York in 1875, where they had 9 children, the youngest of was our grandfather, Walter Rabinowitz (b 1893), who changed his name to Ruby at the time he was being inducted into the U.S. Army in 1917 and sent to fight in France. Last weekend, Tanya and I had a enjoyable and meaningful reunion at the home of Sandy and Mel Brenner of some of the surviving members of the older generation of Ruby relatives; Mel and Sandy Brenner, still going strong at 82 and 78 respectively, Marsha and Shelly, Robert Felenstein and wife Jane and Janice Brenner, the radiant ballerina. As viewers will notice, none of us are as young as we once were, but everyone was lively, upbeat and full of the wisdom of having kicked around this planet for a while. We had a delicious lamb roast, drank wine, talked about many things, including politics. Mel reminisced about having been a McGovern delegate in 1972 and there was a group effort to try to understand why this country has elected so many Neanderthal Republicans over the past 40 years. It was wonderful to reconnect to the liberal passion that was such a part of the lives of Stan and Helga and has been passed down to myself, Jo and Danny and to Janice as well. Excellent values, if I do say so myself. Many thanks Stan, Helga, Mel and Sandy for passing them along to us. Maybe they will come back into fashion in 2008. Too bad Stan and Helga had to leave us during the darkest period of Bushism. But to cite Ted Kennedy and Helga, "The cause goes on and the dream will never die..."
By the way, Sandy recalled that our great-grandmother Rose Ratner always reminsced with her about Rostov that it was the most beautiful city in the world and showed us a set of dishes collected by her mother Til decades ago, each emblazoned with a Rose in memory of her beloved mother, Rose Ratner. How did 150 plus years of our family get from the shtetl to where are now? Well, I think I have to plunge back into the shtetl to understand some of that, so I'm playing guinea pig for that role. I'll be posting on our findings in Rostov and Lithuania when we return on August 8 or perhaps while we are there if we find a working computer. In the meantime, lehitraot and enjoy the photos I am putting up here from the get-together in Massapeaqua. (I'll put up a few more in subsequent posting). Google Books is an amazing resource, the result of the online goliath's project to provide search access to all the world's printed literature. In some cases, their collection contains the entire text of books. More often, a table of contents and sample pages are provided. Other times, only small excerpts of text around the search term are offered. I have only begun to delve through the myriad hits returned for Rabbi Spektor. Have a look for yourself. 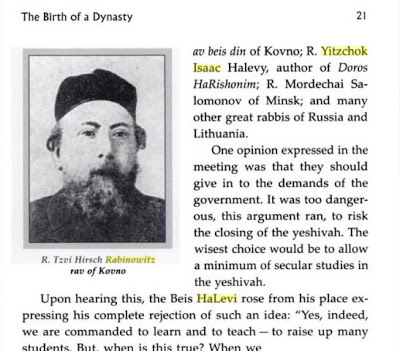 Here is a clip from volume one of the book "The Brisker Rav," a biography of HaRav Yitzchok Ze'ev HaLevi Soloveichik, by Rabbi Shimon Yosef Meller, in a section about the response from various important rabbis to a new government regulation that secular subjects must be taught in yeshivas. I am sure there are others, but this is the first time I have seen a photo of Zvi Hirsch Rabinowitz, the son and successor of Rabbi Spektor in Kovno. At the time of this incident in 1892, Isaac is still living and Zvi is a rabbi (not the chief rabbi) in Vilna. Walter thought he saw a resemblance of Stan in the photographs of YES. I'm not sure who Zvi looks like. Here is a new-to-us document that offers many rich details on Yitzhak Elchanan Spektor's early life and career. I found it on the web site of Kehillas Zichron Mordechai, the orthodox community in Teaneck NJ. The site aggregates biographical articles about important Gedolim (Torah scholars) past and present. The fascinating YES article is adapted by Miriam Samsonowitz from Toldos Yitzchak by Rav Yaakov Haleivi Lifshutz, and is reprinted on the site from an orignal article in the publication Yated Neeman, published in Monsey NY. Unfortunately for us, the chapter ends as YES is assuming his post in Novogrodok, where his two younger sons and grandson Joseph were born. The depth of information in the chapter shows that it is not enough for us to rely on Shimoff for retelling the information in the Lifshutz book. As far as I know, there is no complete translation of Toldos Yitzchak, so this adaptation is the closest thing to it. I have an email address for Miriam Samsonowitz in Jerusalem, and I plan to contact her to see if she also has a translation or adaptation of other parts of the book. Here is the highly recommended full article. Below are a series of excerpts that contain new and interesting information. Yitzchok Elchonon was orphaned at the young age of 10 when his mother passed away, an unfortunate tragedy which was not uncommon in those days. The youth's exceptional abilities first reached the wider public when he became acquainted with a travelling wealthy Jew called Reb Moshe from Keidan. A learned Jew who had written a commentary Imrei Moshe on Megilas Esther and Toldos Moshe on the Haggadah, Reb Moshe had been traveling for his business through Volkovisk and the nearby cities when he came across the young lad and perceived what a genius he was. He praised him glowingly to friends of his, Reb Eliezer Yezersky and his righteous wife Bluma, from the town of Volkovisk. As soon as they heard what Reb Moshe had to say about the lad, they hastened to make a shidduch between Yitzchok Elchonon and their daughter Sara Raizel. A short time before, a different shidduch had been offered for Yitzchok Elchonon with the daughter of another well-to-do householder from Volkovisk. Yitzchok Elchonon, 12 years old at the time, had been invited to the house of the man, where he was grilled for several hours by a panel of Torah scholars to see if he measured up to the proficiency in Torah study which had been claimed about him. Various pastries had been set out on the table for the occasion, and due to the extreme pressure he was under, the lad ate them in a way less refined than the prospective kallah had expected. The young girl disapprovingly pointed this out to her mother, and they both agreed that a youth lacking such basic refinement was surely not worthy of entering their family! The shidduch was cancelled on the spot. Reb Eliezer's wife Bluma was aware of this mishap, but she negated it explaining that the lad was surely so occupied by his love for Torah that he probably hadn't paid attention to how he was eating. Sara Raizel was similarly impressed with the young scholar. The negotiations were quickly concluded and Yitzchok Elchonon was engaged to be married to Sara Raizel at the ripe age of 13. Many years later, when Yitzchok Elchonon's fame had spread throughout the entire world and he was the famous rav of Kovno, he once passed through Volkovisk on his way to visit his father's grave in Roush. Thousands of Jews surged to the residence where he was temporarily staying to seek his blessing. Among them was an unfortunate woman who sought his blessing -- and then discovered to her shock that the great rav whose blessing she sought was the young man whose hand she had rejected years before because of his table manners! Six years after his marriage, and shortly after the time that his own father passed away, Rav Yitzchok Elchonon concluded that he could no longer remain on his parents-in-law'largesse. In 1837, when he was 20 years old, he accepted the offer to become rav of the small village of Zebelen. His wage was fixed at five Polish gold coins a week, and with the time, it was raised to six Polish coins. This was barely enough to keep body and soul together. At first, his parents-in-law in Volkovisk sent the young couple meat and challos for Shabbos. This food is what kept him alive since during the weekdays he basically fasted. But then his parents-in-law lost all their money and could no longer send him food or any other support. During this period, his first son Chaim was born. Chaim was similar in appearance to him, and with the time they discovered that he was blessed with many of Rav Yitzchok Elchonon's virtues. He quickly went to visit the Karliner Rav, and found him sitting on his rabbinical chair discussing Torah with two distinguished scholars of that time -- the gaon of Antipoli, Rav Moshe Hirsch, and the gaon Rav Turdos, who was a moreh tzedek in Karlin. Both of them were known to be great lamdonim, and diligent, profound scholars. Rav Yaakov of Karlin showed them a passage in his book "Mishkenos Yaakov", which had just been published, in which he had replied to a question by Rav Dovid Luria concerning a "petzua daka". The scholars were deeply engaged in a pilpul discussion about the topic, and they paid no attention to the newcomer who respectfully stood off at a distance. Rav Yitzchak Elchonon was somewhat embarrassed to push himself forward particularly since he appeared very young and his beard had not yet grown out. He felt unworthy of pulling up a chair and sitting with these well known Torah luminaries. However, after he followed their discussion for a while, he summoned his courage and spoke up: "Why, the entire basis to this discussion is written explicitly in the Chelkas Mchokek Even Ezra, section 65!" The scholars stopped their discussion and looked critically at the young unknown man. They then welcomed him and asked him to identify himself and thus they found out he was the rav in Zebelen. The Karliner Rav remembered that a few weeks before he had received a shaalah from the Zebelener Rav. He then opened the Chelkas Mechokek and they found the passage exactly as Rav Yitzchok Elchonon had said. Rav Yitzchok Elchonon was then offered a seat among them with great deference, and he was included in their lengthy pilpul. They eventually began to discuss a Tosfos, and with great skill, Rav Yitzchok Elchonon smoothly explained the difficult passages. They were thrilled to see such wisdom and proficiency in so young of a man. Finally, as an exceptional gesture of respect, the Karliner Rav asked Rav Yitzchok Elchonon to give him the pleasure o f beinghis Shabbos guest. The Rav's two other distinguished visitors furthermore honored Rav Yitzchok Elchonon by accompanying him back to his inn. When Rav Yitzchok Elchonon became rav in Baraze in 1839, he received a cool reception from some of the townspeople who felt that a 22-year old rav could not possibly be worthy of their town -- the Karliner Rav's recommendations notwithstanding. One of these townspeople was Reb Yosele Leipziger, a serious scholar who was involved in many of the town's charities. A few days after Rav Yitzchok Elchonon was instated in the town, Reb Yosele entered the rav's house to pay his respects. While there, he asked him an extremely difficult question which Rav Yitzchok Elchonon was able to answer on the spot without even consulting a sefer. "This question was raised by the Korbon Ha'Eda on the Yerushalmi," he told Reb Yosele nonchalantly, and then proceeded to offer his own brilliant answer. Reb Yosele was dumbstruck. Before he departed he said, "I have asked this question from many rabbonim, but I never heard a satisfying answer from anyone until this minute. Your answer alone has satisfied me." That week, Reb Yosele sent him several loaves of bread and chickens as a sign of his reverence. From then on, he never stopped praising Rav Yitzchok Elchonon and treated him with the utmost honor. The psak on which he achieved outstanding acclaim, however, involved a get and a marriage permit document over which he had been at odds with the great gaon Rav Eizik of Shavel. The details of the case were as follows: Reb Nochum of Kaltinen had asked Rav Yitzchok Elchonon to arrange a get for his brother-in-law which was then sent to Shavel. Since he was at that time totally immersed in studying Tur Even Ezra, he didn't quote in the document the words of the Achronim which dispute the view of the Tur concerning the version of the permit document -- even though he of course knew their reservations very well. When the Shavel Gaon saw the permit document, he was upset and declared, "How does such a young rav get involved in arranging a permit document according to the Rishonim, without paying attention to the Achronim who dispute this version!" He irately sent the permit document back claiming it was written improperly according to the view of the Achronim, and he told Reb Nochum that the Barazer Rav doesn't know from his right or left in laws of Gittin and Kidushin! When the document arrived in Baraze, Rav Yitzchok Elchonon's rebetzin received it and saw the sharp reaction of the Shavel gaon. She didn't want her husband to suffer grief before the holiday of Shavuos which was a few days away, so she hid the document and didn't tell him about it. She also worried that the Baraze townspeople would heard that the Shavel gaon had criticized her husband's decision and perhaps decide to send him away. Rav Yitzchok Elchonon saw the secret whisperings in his household and he soon realized that something was wrong. After confronting his wife and insisting to be told, he found out about the Shavel gaon's reaction to his psak. When he heard what it was about, he laughed. "Do you think that I didn't know the reservations of such Achronim as the 'Get Mekushar'and the 'Beis Meir'?" he exclaimed. "However, I repudiated their reservations against the correct words of the Tur." He sat down before Shavuos and wrote his reply to the Shavel gaon in which he explained away these Achronim's reservations against the Tur. He wrote in the tshuva, "I am sending you my reply immediately so it might reach you before the holiday and add to your holiday joy, knowing that the rav who arranged this permit document was not ignorant of the laws of Gittin and Kiddushin." He later received a softly worded reply from the Shavel gaon headed with the title "The great rav" and worded in great respect. Despite his new esteem for him, the Shavel gaon continued to spar with him and dispute his decision. Rav Yitzchok Elchonon then sent him a second reply. Replying to Rav Yitzchok Elchonon's second letter, the Shavel gaon wrote with even greater respect, addressing him "HaRav Hagaon" which -- unlike the latter half of the nineteenth century -- was bestowed on only a very few. To disciples of his in Shavel, the Shavel gaon remarked that he had become involved in an issue with a rav who is a mighty gaon, a true lion. After receiving Rav Yitzchok Elchonon's reply to his second conciliatory letter, the Shavel gaon sent him a letter of apology and appeasement asking his forgiveness for slighting his honor. It was after this event, that Rav Yitzchok Elchonon's fame spread far and wide. Shortly after this, Rav Yitzchok Elchonon's friend and admirer, Reb Nochum of Kaltinen, was visiting the large town of Nishveze for treatments from the famous Jewish doctor Dr. Kisselevsky. This famous doctor had been sent specially by the Count Radziwill who owned the district to study medicine so he could be his court doctor. In the manner of those times, Dr. Kisselevsky was not only great in medicine but was also a considerable Torah scholar, a great giver of charity, and a beloved personality. He was among the leaders of the Nishveze community. When Reb Nochum came to Dr. Kisselevsky for treatment, they also enjoyed a riveting conversation on numerous topics, as Jews from different towns are wont to do. Reb Nochum mentioned his veneration for Rav Yitzchok Elchonon and various stories of his greatness which were already circulating at the time. Upon hearing this, Dr. Kisselevsky spoke with the parnessim in the Nishveze community who were just then looking for a rav. They decided to send Rav Yitzchok Elchonon a k'sav rabbanus to become the rav of their town. The Jews in Baraze were shocked when they heard of this development. They were angry at even hearing the suggestion and they resolutely declared that such a thing would not be! They would not allow their beloved rav to leave them under any circumstances! Reb Nochum had to plot an underhanded scheme through which to steal Rav Yitzchok Elchonon away in the middle of the night using the services of his old melamed, at present the rav in the town of Opina. They waited for a freezing cold night and had Rav Yitzchok Elchonon walk out unattended to a set spot. Once they got Rav Yitzchok Elchonon to the outskirts of the town, a wagon suddenly appeared, pulled by fast horses, which was to transport him to Nishveze. He was taken through a side route winding through fields and forests so that if the Baraze Jews pursued after him, they wouldn't be able to catch up with him. It was the thick of the winter during the month of February. Rav Yitzchok Elchonon was starving and frozen to the bone when his wagon made a short stop at the home of a Jew located at the periphery of a forest. He entered the small house hoping he would be able to warm his bones and have a bite. Seeing the young rav by himself, his host began to question him where he had come from, who he was, and what urgent mission was he on that brought him out in such a terrible frost. Rav Yitzchok Elchonon replied that he was traveling to take the position of Rav in Nishveze. The host gave the young man an austere look and then began lecturing him for even thinking that a young man such as he could assume the mantel of the rabbinate in such a large, distinguished community. Finally the shivering Rav Yitzchok Elchonon pleaded with him, "I'm about to die from hunger and cold! Do you have something I could perhaps eat? Then maybe I could pay better attention to your lecture." This host, who was somewhat of a scholar, later settled in Nishveze himself. Later on, whenever he would bump into Rav Yitzchok Elchonon, he would mention for the umpteenth time his improper tirade in the forest, and beg forgiveness for daring to rebuke Rav Yitzchok Elchonon without knowing what a prince of Torah he was. Rav Yitzchok Elchonon was accepted in Nishveze with great honor, although there were a few distinguished parnessim who did not look favorably at their community being led by such a young man. They sneered, "This young fellow, who hardly has a beard, should sit on the rabbinical seat of respected and ancient Nishveze!" One of those who was against his appointment was a wealthy learned Jew called Reb Shemaya who refused to sign the k'sav rabbanus. "What is Nishveze coming to?" huffed Reb Shemaya, "Shall I have to stand in front of such a youngster? This is unheard of in Nishveze!" However, the town's great scholars stood squarely behind Rav Yitzchok Elchonon, and they did their utmost to convince the wealthy men and the notables in town to agree to the appointment. "Let us test the Baraze Rav and see how well he holds his own in pilpul!" they suggested. Their suggestion was accepted reluctantly by the parnessim. Even though Rav Yitzchok Elchonon had already been offered the rabbinical appointment, he had a well established reputation and had resolutely defended his psakim many times in the past, he was not insulted by the sudden challenge. The greatest scholars in town engaged him in intense pilpulim for two long weeks. These were Nishveze's keenest scholars, many of whom afterwards became gedolim and great rabbonim in Lithuania. After these two weeks of razor-sharp pilpulim and arguing, they were forced to acknowledge that Rav Yitzchok Elchonon had bested them. They proclaimed that despite his shining reputation, the world does not even know half of his great accomplishments in Torah. When the wealthy Jews and notables of Nishveze heard this, they all proceeded to sign their names to the rabbinical appointment document. Even Reb Shemaya agreed to sign his name. Rav Yitzchok Elchonon spent four happy years in Nishveze. The town prided themselves on having such a distinguished rav, and they fully submitted to his authority. After four years, Rav Yitzchok Elchonon was victimized by a informer, who slandered him to the authorities claiming that the rav had tampered with the censoring of certain works. In the wake of this attack, Rav Yitzchok Elchonon was forced to travel to the city of Kubrin once a month to be interrogated by the authorities. Jewish communal leaders from Novordok came to his aid, and they promised to help rid him of this unfortunate burden -- on condition that he kindly consent to become the Rav in Novordok. The Nishveze Jewish community heard suspicious rumors that the Jewish community in Novordok wanted to whisk away their rav, and huge protests broke out. Sleuths were sent to shadow the rav 24-hours a day so he could not be spirited away. Any suspicious character who might be targeting their rav was unceremoniously chased from the city. After investing huge efforts and laying numerous plans, a way was finally found by the Novordok community to steal the rav out of Nishveze. He was crowned the rav of their community in 1851 on 28 Iyar.